The previous blog discussed three brands of adhesive putty that could be used to stick HandlePod on just about anything. They all more or less worked except for Dap BlueStik (too soft and minimal adhesion). Loctite Fun-Tak is a bit stiff and not real sticky. Scotch mounting putty was the best of the three and easily available. But the search continued for a material that would stick even more firmly. Alcolin Sticky Putty provides superior adhesion to attach HandlePod to any surface. Alcolin Sticky Putty has much better adhesion and is easily pliable. It is the best material found so far. It comes in a three-ounce package and the putty is a flat rectangle divided in half down the center. It is sandwiched between two strips of paper (save this paper for later). Alcolin Sticky Putty attaches easily to HandlePods feet to stick your camera on any surface. The Sticky Putty strip is split in half down the middle. Separate the two halves and cut one of the halves into four equal strips. Roll each strip into a marble-size ball. Then press each lump of putty onto the four feet of the HandlePod. Group photo taken with phone on HandlePod attached to the wall with adhesive putty. That’s all there is to it. 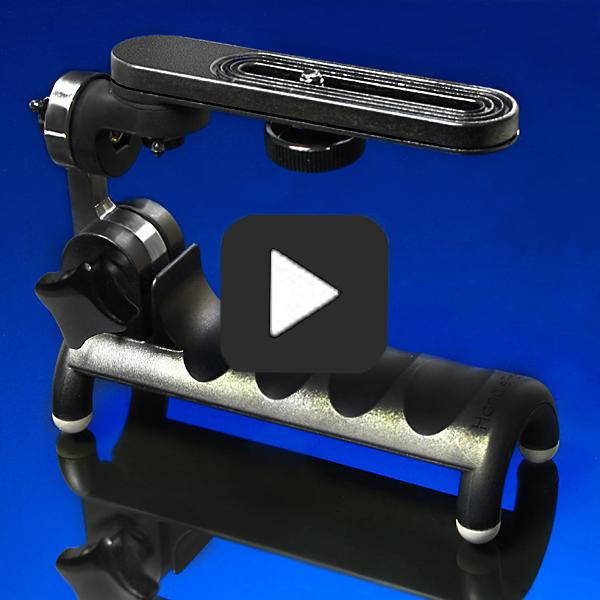 Now you can press the HandlePod against any solid surface and it will stay in place. It will hold a smartphone, GoPro, action cam or any small still or video camera on just about anything. Imagine the possibilities when a wall, a door, a window or any solid surface can hold your camera for whatever photo, group shot, self-portrait or video you want to shoot—no selfie stick or asking strangers to hold your camera! With your camera stuck on a wall you’ll need a remote shutter release to take the photo. A remote for a smartphone is the best method since you can fire the shot whenever you want. They come in a variety of models and prices and will work on Android or iPhone with a Bluetooth connection. Another option is to use a self timer on the phone which will count down for a programmable number of seconds then fire the shutter. Most phones either have this option or it can be added with an app such as A Better Camera for Android. When you are finished shooting it is easy to pull the sticky putty from the surface. It should come off cleanly but anything remaining can be removed by pressing the putty onto the residue and pulling it off quickly. When you are finished you can remove the putty from the HandlePod feet the same way. Use the paper the putty is packaged with to wrap up the lumps of putty for future use. A small amount may remain on the rubber feet but this is not a problem. In fact it improves the high friction, non-slip properties of the HandlePod, making it easier to hold in place by hand. Sticky putty on HandlePod is a perfect way to attach a camera phone, Go Pro, action camera or point-and-shoot to just about any available surface. Mirrorless, bridge cameras or other larger cameras will work but it is important to check adhesion first. Make sure the putty will hold on the chosen surface before attaching a larger camera. Some surfaces work better than others and it is essential to make certain the putty will hold before trusting a heavier, more valuable camera to it. But sticky putty on HandlePod is a simple, inexpensive way to turn any solid surface into a reliable camera mount. This entry was posted in Tripod Alternative on March 19, 2017 by main user.